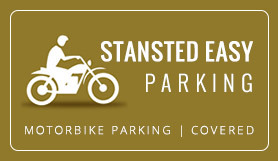 Stansted Easy Parking now offer an affordable, secure and easy parking facility for Motorbikes. This service is conveniently located 1 mile from the terminal building and they offer an optional transfer service or it is a 10 minute walk. Your Motorbike will be locked within a secure locked unit with CCTV. You will also be able to store your motorcycling clothing with them at £1.00 per day locker hire making this even more convenient for your flight. Their opening hours are 04.00 - 23.15. You can leave all of your motorcycling clothing if you wish, or you can hire a secure locker at a cost of £1.00 per day. We ask that you print your confirmation email and hand it to the parking facility on arrival. Hours of operation: 04:00 - 23:15 please do not book out of these times, if your flight is delayed we will wait till 02:00 only otherwise you can only collect your bike after 04:00. This product is for motorbike parking ONLY. You need to make your way to our secure facility which is 1 mile from the terminal, address and postcode will be supplied on your confirmation email. On arrival please call the number provided and we will open the main doors so you can park your motorbike and sign the relevant paperwork then we will issue you a receipt. (2) We can transfer you at a cost of £3.50 each way. On return, if you require the transfer back to the secure unit please call the number provided on your confirmation email. If you do not require the transfer service, please call the number on your confirmation to make them aware that you have landed and walk back to the secure unit and present a member of staff with the receipt you were issued at drop off. Follow the road for just over 1 mile and take the Stansted Airport exit and branch left. At Bassingbourn roundabout take the 2nd exit onto Thremhall Avenue. At Coopers End Roundabout take the fourth exit this is after the Short Stay Car Parks. At the mini roundabout turn left, travel 0.7 of a mile on your right is Waltham Hall Industrial Estate. ride to the bottom, we are the unit on the left just before the bus station. Take the A120 exit to Stansted Airport. At Priory Wood Roundabout take the 3rd exit, merge onto the A120 and branch left. At Bassingbourn roundabout take the 2nd exit onto Thremhall Avenue. At Coopers End Roundabout take the fourth exit this is after the Short Stay Car Parks. At the mini roundabout turn left, travel 0.7 of a mile on your right is Waltham Hall Industrial Estate. ride to the bottom, we are the unit on the left just before the bus station.